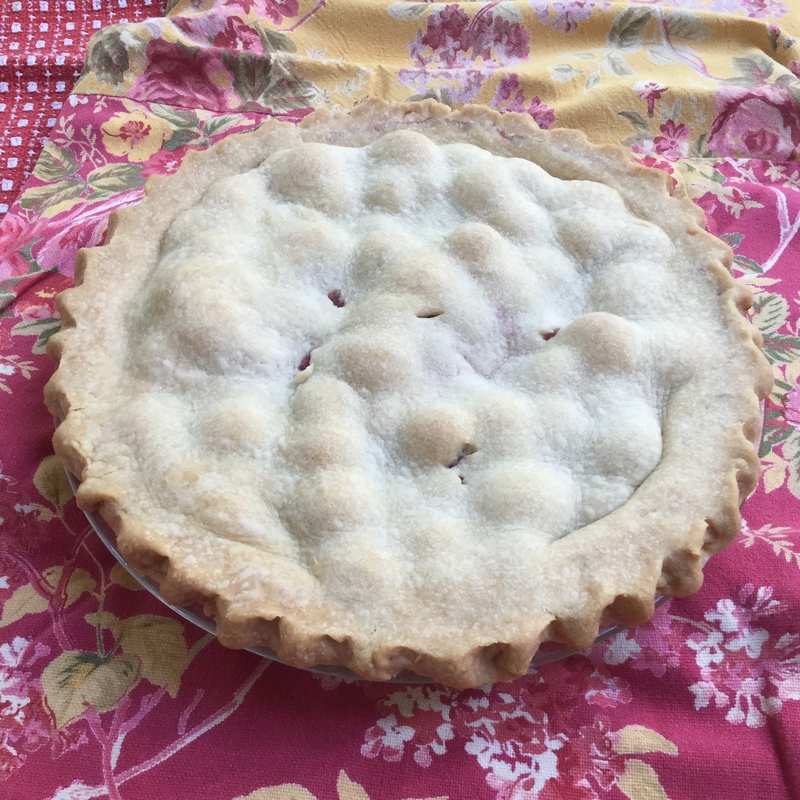 Just a few years ago I started making fruit pies with fresh fruit when it is in season. For me, what an amazing difference – the pies just seem to turn out perfect. I am sure having the fruit at its peak is one factor. Also frozen fruit always seems to have so much liquid and it is hard to know how much to keep and how much thickener to add. I have tried many pie crusts but keep going back to this one. I like a somewhat thin flaky crust that is easy to work with….this one suits the bill for me. When I first made pie crust I would always do it by hand, but now I like the ease of using the food processor and I feel it still has the same perfect results. Place the flour and salt in food processor. Add cubed cold butter and Crisco. Pulse until you have fine crumbs. Add 4 Tablespoons cold water, add more if necessary. Dough should be firm not sticky. Divide dough in two and flatten into disks. Wrap in plastic wrap or wax paper and refrigerate for 30 minutes. Preheat oven to 400 degrees. Place pie on a lined cookie sheet and place it on center rack. Bake 20 to 25 minutes until the top crust is golden brown. Reduce oven to 350 degrees and continue to bake until juices bubble and crust is golden brown. If you would like a little thicker crust increase the flour to 2 1/2 cups, and the butter and shortening to 1/2 C, and the water to 5T +. I use the same amount of salt. You may add additional flavorings if desired. (I added other choices to the printable recipe). Combine ingredients into bowl and allow to sit for 15 minutes before placing in pie shell. I add a tap of almond extract to my sour cherry pies and it is delicious. Thank you Peggy, that is one of the flavoring choices, I will try it the next time I bake a cherry pie. Cherry is my husbands very favorite. Good morning Jane, I am anxious to make your crust. I always used only cisco in the crust but really like the combination with butter. On your peach pie you have listed ingredients but the last thing is 1/4 tsp of ???? Optional. What is it to be? Thank you for sharing all of your wonderful recipes. I r wally enjoy your blog. Thank you for catching my mistake, the missing ingredient is nutmeg. I have updated the post and have also added other options on the printable pdf. According to the cookbook for the crust, the butter is for flavor and the Crisco for flakiness. Also thank you for your kind words on my blog. Sometimes you wonder if people are reading it. It is so encouraging when someone gives a comment or tells you that they made something that you posted whether it is a recipe or project. He is a pie guy. I never realized how good fresh fruit pies could be compared to using frozen fruit.